The Super Swampers gathered on a sunny day. 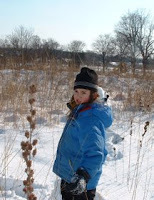 We collected stems and seedheads of native wildflowers. While it was chilly, it was fun to flounder in the deep snow. Later we went inside and made plant identification guides to post in the kiosk.